Wishing everyone a joyful and safe Makar Sankranti ! beginning of warmer and longer days. Sitting here on sofa while writing this post on a cold and wet afternoon, I am looking out the window, the sky looks dark gravel grey, large pillows of clouds are have formed and I can hear murmuring of the rain through window. While I am gazing through that window, I thought about this beautiful line which I read somewhere that If beauty is God's signature, then rain is his final flourish, I smiled, same time memories conjured up in my mind how we used to celebrate this time of the year back in India. In Gujarat, Makar Sankranti not only a religious observance,but there is a special significance attached to the celebration of Makar Sankranti, it is Kite Flying. Gujarati's not only look reverentially up to the sun, but also offer thousands of their colorful oblations in the form of beautiful kites all over the skyline. People of Gujarat celebrate Kite Flying with great fanfare and zeal, same time they take Kite Flying very seriously. Beginning of the January, people starts making preparations for this day. Myself and, my siblings requested our parents to buy us kites and special strong string called Manjo. Along with our stuff, mum would buy sesame seeds, Peanuts, Puffed Rice, sugar cane and bor ( juju berries ) to prepare some treats for us to enjoy. On a previous day she would prepare Mamra Ladoo, Til Chikki, and Peanut Chikki and sometimes Kachriyu as well. On actual Makar Sankranti day she would make Undhiyu, Gajar Halwa and puri early in the morning so we all can enjoy whole day with friends and family on our Dhaba ( rooftops ) While we kids and other members of the families bask in the glory of Uttrayan, most of the ladies would bring one or two dishes and everyone gather around and enjoy each other's dishes. I was looking for something to make with sesame seeds which is similar to sesame fudge or ladoo, Wasn't long before I discovered Rachel Allen's delicious Tahini Halva, I made up my mind and eagerly waited for Makar Sankranti. Enjoyed making it, twice in just a one week, that shows how much we loved it! taste wise it came out perfect but first time came out smoother and chewier, but no one complained, actually daughter preferred a softer texture, for her, a smoother texture is incredibly delicious and satisfying. It is challenging to achieve flakiness in this halva, as it is very important to keep honey syrup's temperature right. The second batch I made came out more flaky and dense, I am happy! Rachel made this halva only with two ingredients, Tahini ( sesame paste ) and Honey. The craziness I have to use nuts in almost every recipe, can't get rid of easily and decided to use Pistachios for a crunch and edible rose petals and water for a floral note. Various nuts and rose water or rose petals are heavily used in Middle East cuisine. Also, I kept honey syrup's temperature higher than what Rachel kept it and increased the tahini volume. Halva is basically a crystalized paste of sesame seeds ( tahini ) and honey. A flaky sweet confection! Tahini halva found throughout Middle East, North Africa, Jewish world and Asia . Save and Share this recipe just a click away! 300 g light tahini paste mixed properly with the excess oil. Line the base and sides of a loaf tin with baking parchment. My loaf tin was much bigger, so didn't get much hight to my halva. In a heavy based pan pour honey and start heating on high heat. If using thermometer place in the pan now. Keep stirring and let it simmer until the thermometer reaches 260 F or Firm Ball stage, switch off the heat. Leave it to cool for 3 minutes. Meanwhile, place tahini paste in another pan and gentle heat, keep stirring for 3 minutes. Add rose extract, 150 g nuts and warm tahini in to the hot honey syrup. Combine well and pour the halva mixture in to the loaf tin. Seal the loaf tin with more parchment so moisture stays out and place in the fridge for 36 hours to allow small sugar crystals that gives halva distinctive flavour and texture time to develop. Cut with very sharp knife into pieces while halva is still cold, but serve at room temperature. 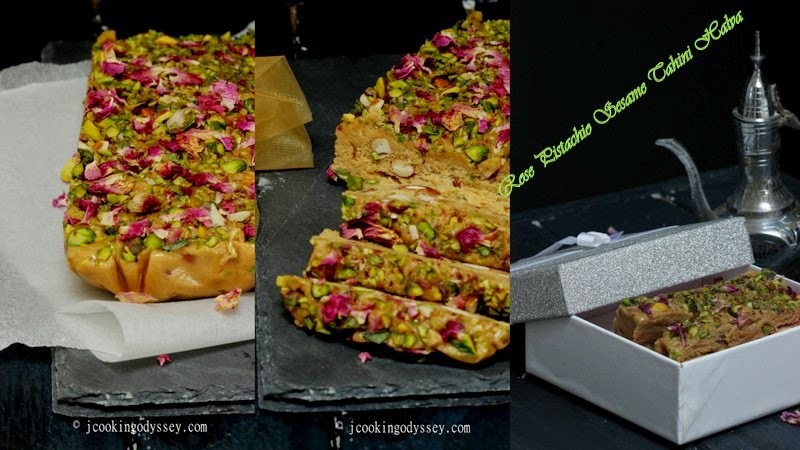 Halva with roses and pistachios is a real treat to my eyes....looks delicious. This is the most interesting and exciting Halva recipe I've ever seen! I LOVE IT! Looks and sounds delicious! Very interesting to learn a bit more about Makar Sankranti - something I knew nothing about before. I grew up eating halva with pistachios so this sounds perfect for me! 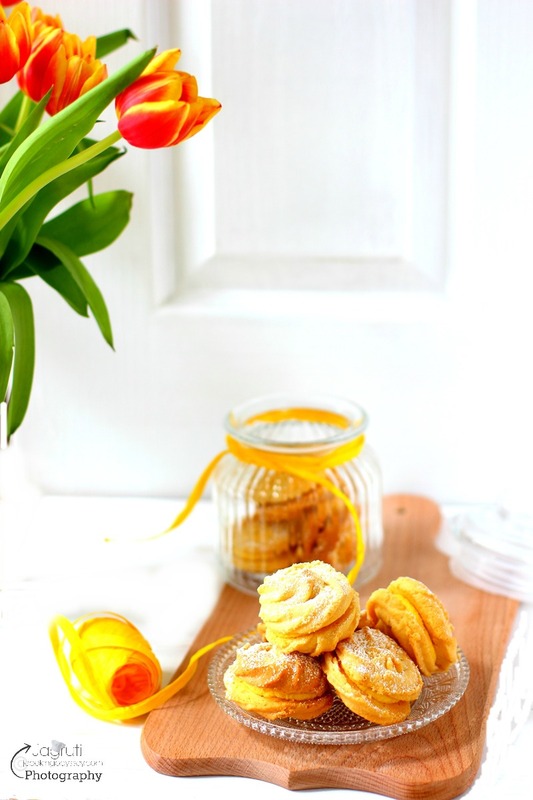 This is such a beautiful treat with delicious ingredients! Hope you enjoy your celebration! Oh man.. tahini, rose petals, honey, pistachios... this sounds INCREDIBLE! This looks and sounds amazing! I would love to try it.